The San Diego-based cereal maker Kashi is a topic of discussion among consumers this week after a blogger on the Green It All website pointed out that some of its products contain genetically-modified ingredients. That information isn’t news to people in the natural-foods industry, but it’s just now making the rounds of social media, inspiring 171 comments on Kashi’s Facebook page this week. Earlier this year, most of the company’s products were pulled off at least one grocery store’s shelves. And for the past two years, San Diego-based natural grocer Jimbo’s hasn’t accepted new Kashi products because of concerns about GMOs, or genetically modified organisms. A spokeswoman for Kashi, which has headquarters in La Jolla, declined to respond Tuesday to emailed and telephoned requests for comment. Kashi recently joined the Non-GMO project and hadseven products verified as Non-GMO: 7 Whole Grain Flakes, 7 Whole Grain Pilaf, 7 Whole Grain Puffs, Autumn Wheat, Cinnamon Harvest, Island Vanilla and Strawberry Fields. Numerous “natural” products were indeed contaminated with high levels of GE ingredients, sometimes as high as 100%: Kashi® GoLean®, Mother’s® Bumpers®, Nutritious Living® Hi-Lo®, and General Mills Kix… Several Bear Naked® and Kashi® products contain hexane-extracted soy protein. The “hexane bath” that the soybeans are immersed in consists of more than 50% n-hexane, which is a known neurotoxin, according to the Centers for Disease Control and Prevention. San Diego’s major natural food chains – Sprouts and Jimbo’s – still carry Kashi products, although some don’t conform to Jimbo’s 2-year-old GMO policy. Jimbo’s didn’t remove any products from its shelves, opting to “grandfather” many products it already carried – including Kashi cereals such as Good Friends – but it won’t add new products that don’t meet its rules, said buyer Andy Huth. 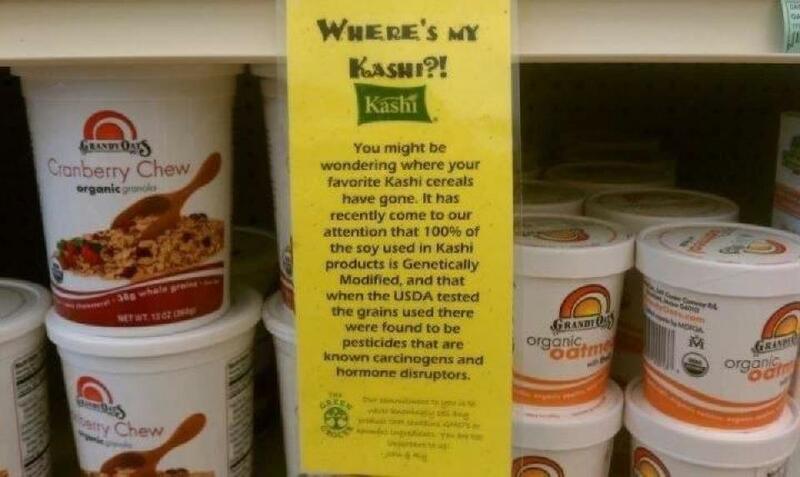 This isn’t the first time that Kashi has faced criticism for marketing itself as a “natural” company. On August 31, 2011, a class action lawsuit was filed against Kellogg/Kashi for allegedly misleading consumers with its “natural” claims. The plaintiff said that GoLean Shakes, for example, is composed almost entirely of synthetic and unnaturally processed ingredients. 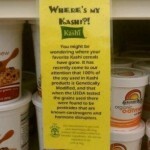 The spokeswoman for Kashi declined to comment on the lawsuit.